Do you know I've never owned a proper ironing board? I've always used a mini, tabletop board, which sits on top of a chest of drawers. I love my little ironing board and enjoy recovering it with new fabric every few years. It's tucked right next to my sewing machine where I need it most. Granted, its diminutive size isn't so great for pressing long seams when joining rows or making quilt backs. With lots of shifting, I made due until.... we decided to open a longarm quilting business. Often a quilt top or back will need a quick press prior to quilting. Going into longarm quilting doesn't require much new gear (other than the longarm, cough), so I decided it was time to buy a big girl ironing board. Yes, I'm moving up in the world! When it comes to sewing tools, Sew Vac Direct is my go-to shop. Since I got my Juki sewing machine there years ago, they have provided excellent service. If you call with a question, a real live person answers and actually knows what you are talking about. It's great! Anyways, I asked a contact at Sew Vac Direct to recommend an ironing board that would stand up to regular use. I wanted something sturdy that would last, rather than the cheapest lightweight from a local big box store. Well, I received some good advice and more. Doug suggested Sullivan's Ironing Center, instead of an ironing board. So here's the deal - it's an investment. This piece of furniture is about 3 times the price of an ironing board. But, BUT, it is so much better. 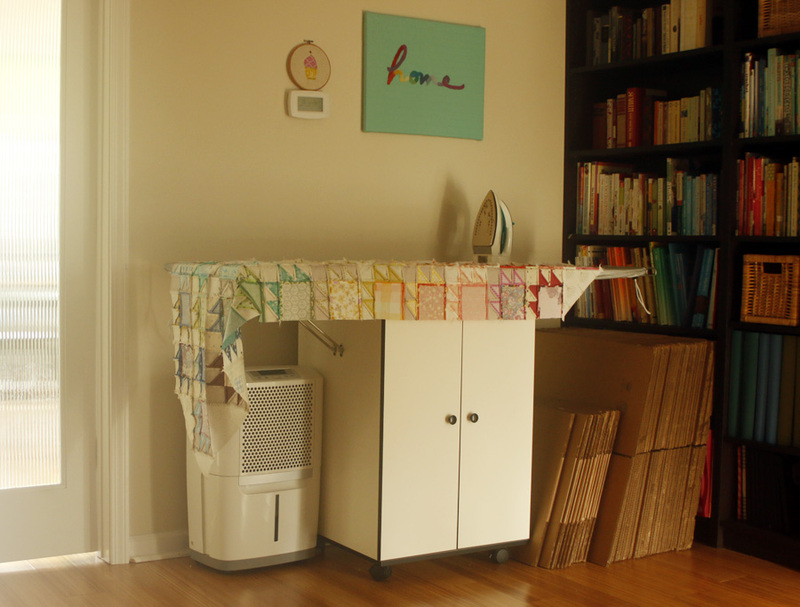 If you're on a strict budget, stick with a mini table top ironing board. If, on the other hand, you want a fantastic pressing solution for a quilter, something that's sturdy, big and space-smart, this is your girl. The other week our Ironing Center arrived. After some assembly, we set it up just outside the sewing room. Unlike a regular ironing board, this can stay up and ready to use. Baby won't be hurt knocking it over and the iron can remain plugged in behind the table, where she can't reach the cord. The pressing space is amazing. It's a massive 59" long and 22" deep. That's plenty of room to press my long seams. I love that it's rectangular instead of narrowing like a normal ironing board. Quilts don't narrow! All this space means I can press faster with little shifting. Hurrah. Oh, and it comes with a fitted, padded cover that's easy to remove. Sullivan's Ironing Center is so space smart. Each side folds down for a more compact footprint when not in use. We'll keep ours fully extended since, as you can see, we're storing our shipping boxes under one side. And speaking of storage, since it's a cabinet instead of a regular ironing board, it has hidden storage too. Nice. I'm pleased as a peach with this pressing solution. It feels downright luxurious after using a mini board for so many years. 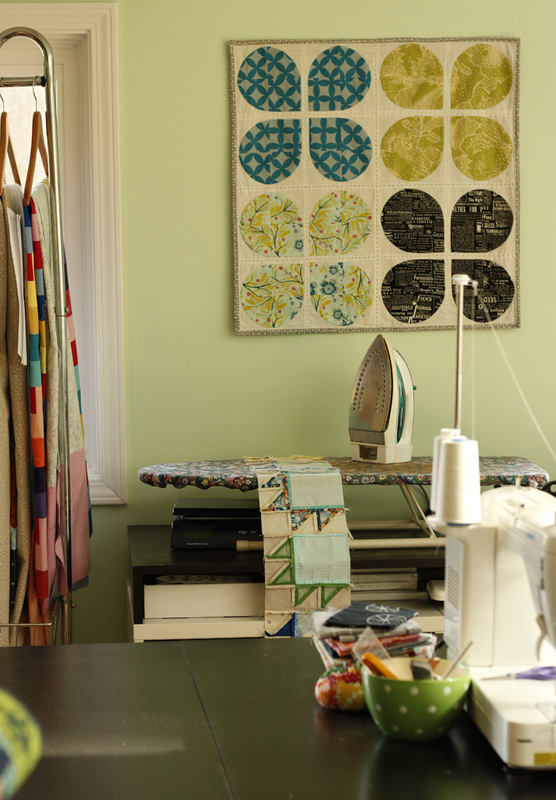 If you're lucky enough to have a dedicated sewing space and have been thinking about a new pressing solution, this one is a quilter's dream come true. Note: Sew Vac Direct has sponsored this blog since 2013. They're one of the reasons I've been able to keep up Stitched in Color for so many years. It's important to specifically disclose our business relationship here, since I'm recommending one of their products. Please trust that, even so, I would not promote a product to you, my dear readers, that I do not truly believe in. My relationship with you most definitely comes first.